The materials used and the way the fence is constructed are key elements in keeping your fence standing tall against windy weather. Consider the different materials available and also give some thought as to what the purpose of the fence will be. Armed with this information, you will be in a better position to choose the right type of residential fencing for your wind-affected property. 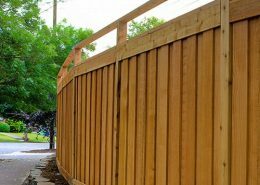 Let’s take a look at a few key areas you need to pay special attention to before installing a fence in a windy location. One of the most important things you need to consider is the stability of the fence. Strong winds can push a fence over that is not planted firmly into the ground. Timber fencing can resist the pressure of the wind, but you will have to ensure that the stakes are deep-rooted so that they don’t become dislodged. You will also have to make sure that the timber you are using is strong enough to withstand the wind pressure. Made from high-quality steel, Colorbond® steel fencing is another great choice for high wind areas. Not only are they strong and durable but they can be installed using Colorbond® plinths that keep them firmly rooted, especially in areas where there may be different soil heights to content with. In addition, they come in a range of colours so your fencing not only stands up to the wind but looks great too. When it’s windy, dirt and debris can be blown around and hit your fence, potentially causing damage and making it look weathered. To avoid having to paint or treat your fence regularly due to adverse effects from the weather, take some time to choose the right weather-resistant residential fencing material. For example, with a treated pine fence, the treated timber is designed to allow the fence to withstand harsh weather conditions and to resist to fungi, bores and termite infestations. Since the timber is already treated, you don’t have to worry about retreating it again and again as you may have to with other types of timber. 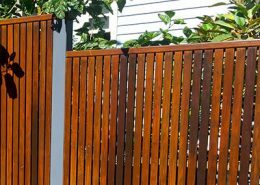 Likewise, Colorbond® fencing is a great choice as this type of fencing is not subject to rot or corrosion and it resists peeling, chipping and cracking meaning it will stand up to the weather for many years to come. As with any addition to your home, the residential fencing you choose is going to come at a price. Timber fencing is generally a little bit cheaper than Colorbond® fencing but both offer great bang for your buck. The size of your property will ultimately dictate how much fencing you are going to need and therefore how much you might need to allow in your budget. Remember to look at the big picture and not just the initial cost. Why Invest in Residential Fencing That Will Last? Investing in the right residential fencing now could save you a lot of money and hassle down the line. If you install a sub-par fence, you will have to continually repair, replace or treat your fence when those strong winds blow. Your property also won’t be protected from the elements and could easily be damaged in a storm, costing you even more money. If you make the right choice now, you’ll have more money in your pocket, a home that’s properly protected and peace of mind knowing that you’ve made the right decision for you and your family.